Cynthia has decades of experience in helping cats living outdoors and brings that to her own colony as well as stepping up whenever others who work with HCMT need help and in assessing situations and working with reluctant or confrontational cat owners to get assistance for cats in their care, and she also schedules appointments for clinics which often include as many as 100 cats from dozens of people from all over the Pittsburgh region, with numbers and needs that change every moment. Twenty-six years ago living in an apartment complex in Charlotte, NC Cynthia saw cats eating from a dumpster. “I was appalled and couldn’t stand to see any of them starve. I started feeding them in and out of my apartment,” she said. The practice of TNR was barely known in the US then and not even knowing humane traps existed, Cynthia was determined to help these cats. “Common sense told me they needed medical attention,” she said, and over a period of time she managed to get each of these feral cats, one by one, into a carrier and took them to her own vet for spay /neuter, vaccinations and any other medical care. Unfortunately there were a few diagnosed with leukemia that had to be euthanized. “I adopted my first ‘feral’ cat back then. It took me two years to socialize her,” she said. Move forward ten years and she happened to find a family of two cats and three kittens huddled inside a clothes hamper on an old man’s porch in the dead of winter. He begged her to take them but they too were feral and she didn’t have the luxury of catching them over time. That’s when she learned about trapping cats like these and where to get humane traps. She trapped them and adopted all five of them, and one is still with her today. She stayed connected with Michelle and began to help her trap cats around the city and transport sick cats to the clinic. Eventually she started scheduling spots for HCMT clinics and still does that today—literally today! Cynthia was also part of the Ford City trapping effort in January 2014. She was one of those who spent two days in single-digit temperatures to help trap 90 cats in the trailer park. Traps were set all over the park and in that weather they had to constantly monitor them all—a cat could develop hypothermia in a very short time with temperatures near zero—so it meant trudging all over the trailer park in deep snow, constantly checking traps. The only place large enough to care for the cats was in an abandoned caretaker’s house on the property that had no utilities, and Cynthia also helped care for the cats before/after surgery in a cramped, cold, dimly lit room in the house. She was there for two long days along with other volunteers in the most grueling and physically difficult trapping effort she’s done. Using her calm and quiet disposition and her skills in managing people Cynthia regularly helps to intervene when cats in neglectful or abusive situations need care or need to be removed for their own safety. In one of the most stressful and emotionally draining efforts she negotiated for months with two manipulative, deceptive hoarders living in a rural area nearly an hour from her home to convince them to bring their sick and pregnant cats to the clinic. “Finally, we arranged to pick up cats at their house and essentially sold our souls to do whatever we could to get those cats and kittens out of a neglectful situation,” Cynthia relates. “I can’t remember how many we rescued, but Debby Nicola and I took at least 15 cats and kittens out of there.” Many of the cats who were rescued needed extensive medical treatment and a few did not survive. She’s not exactly sure how many cats she’s trapped since she’s been with HCMT but thinks a conservative estimate would be more than 100 over the past three years. She can’t trap cats anymore because of an injury, but it gives her great satisfaction to collect materials so HCMT rescuers can provide shelters for as many homeless cats as possible. Over the past two years she has rescued and adopted eight cats and fostered one, and currently cares for nine cats in her house, 10 cats at her Bloomfield colony and helps care for a colony of seven one day a week. 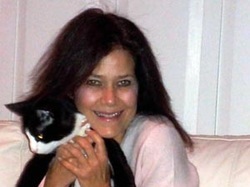 She is pictured with one of her cats, Henri Houdini. “Making certain that community cats are being responsibly fed and cared for is extremely important to me,” Cynthia says, and she finds educating people about trapping and caring for community cats rewarding. She recently joined Humane Action Pittsburgh, a grassroots organization, and hopes to work with others to change and make new laws that protect the rights and dignity of all animals.